A few weeks ago I posted a poll regarding cooking utensils and the mandoline slicer won. This is one of those tools that seems almost one purpose at first, but if you have one, it quickly becomes an essential tool in your kitchen. Reader Andy was quick to comment on that post that I should be sure to include how to pronounce mandoline in this post. This question, of course, made me question how I pronounce it. Am I saying it wrong? Well, Wikipedia says there are two pronunciations (one French), but essentially I say it like man-dough-lin. Not man-dough-line. It’s possible this is wrong, but nobody has ever called me out on it so I’ll stick with it. And now that you know how to say it, you can make this Beet Gratin which is, well, amazing. 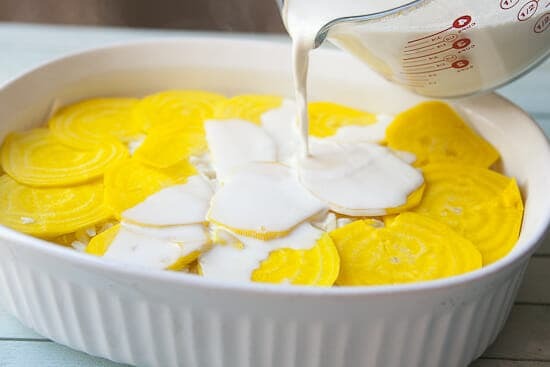 Layers of golden beets and potatoes sliced thin and baked with an infused cream sauce.This is great spring side dish that everyone will love! 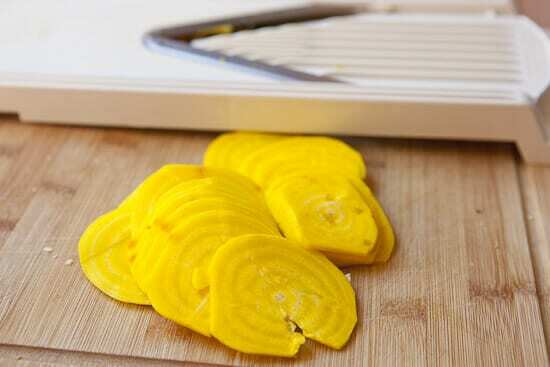 1) Preheat oven to 375 degrees F. Peel potatoes and beets and slice on a mandoline slicer into thin slices. 2) Add half and half to a small pot over low heat. Add garlic, herbs, and salt and pepper. Heat until steaming, but not simmering. Kill the heat and let the half and half cool gently. Then strain out the aromatics. 3) Lightly butter or grease a 8×8 baking dish (or 2.5 qt. baking dish). Lay down a single layer of potato slices. 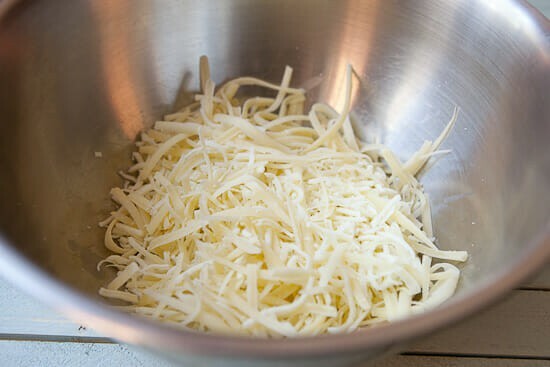 Sprinkle very lightly with cheeses. Then add a layer of sliced beets. Repeat with two more layers of potatoes and beets (6 layers total). 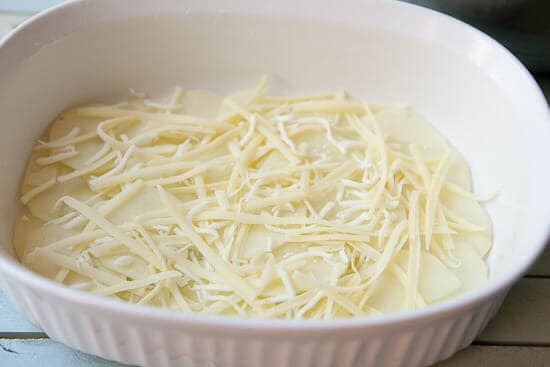 4) Press down on the gratin to compress the layers as much as possible. Then drizzle infused half and half over the gratin. 5) Cover with foil and bake for 45 minutes at 375 degrees. Remove foil and bake for another 20 minutes until gratin is tender in the center and the top is lightly browned. 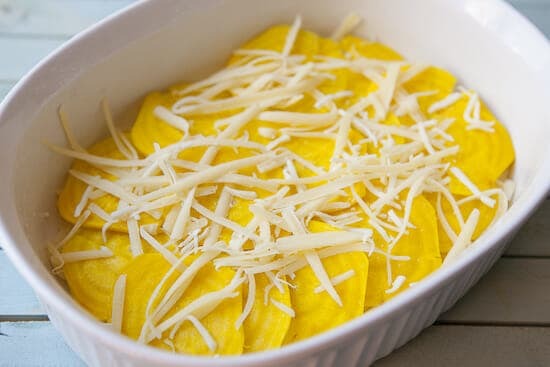 6) Let the gratin cool for 5-10 minutes and then slice and serve! Optionally, garnish gratin slices with fresh oregano. This Beet Gratin gets some great flavor and color from the golden beets, but it would be a bit bland without this infused dairy mixture. 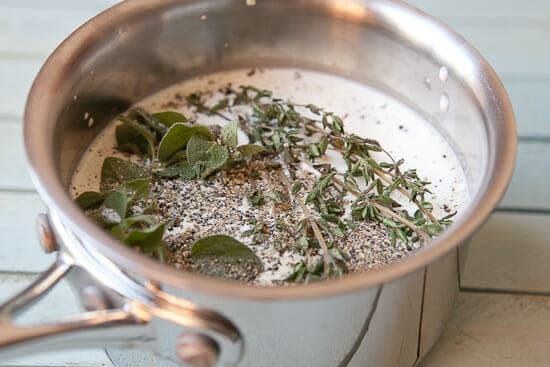 Add the half and half, garlic, salt, pepper, oregano, and thyme to small pot and place it over low heat. Slowly heat the milk until it’s steaming, but don’t bring it to a boil or it will scald. 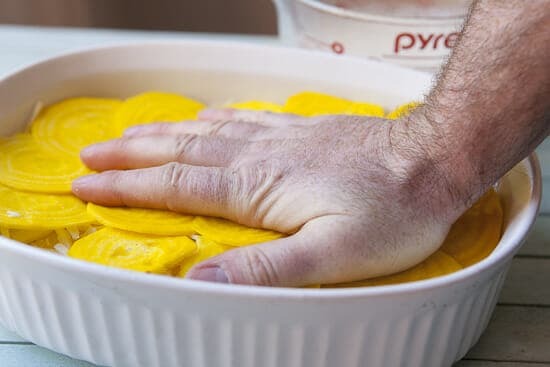 Once it’s steaming, go ahead and remove it from the heat and let it cool slowly for a few minutes. 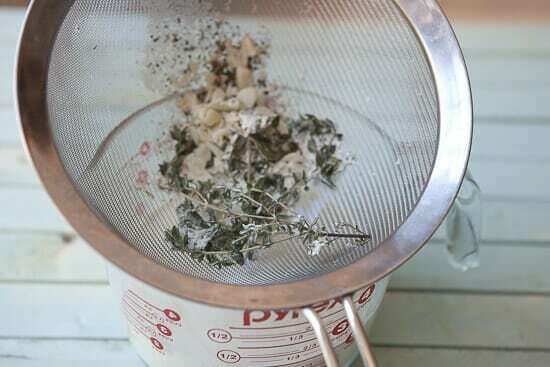 Then I recommend straining out all the aromatic stuff so you have a smooth cream mixture for the gratin. At this point most of the flavor will be cooked otu of these things anyway! Makes for a clean gratin. 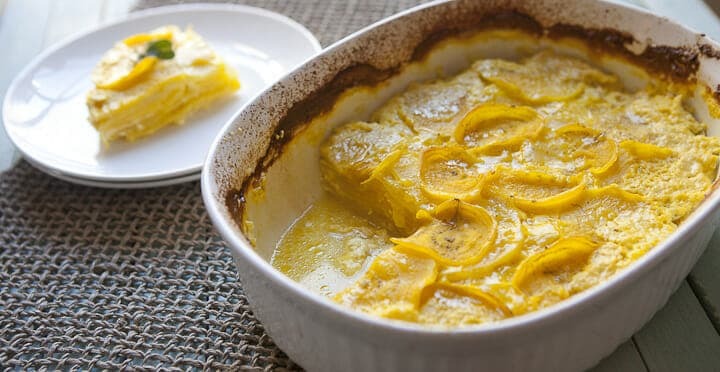 Can you make this dish with a knife? Sure. If you have some nice knife skills and a steady hand, but it’s still going to take you a long time to slice the beets and potatoes. If you have a mandoline slicer though, it takes maybe a minute to make even, thin slices of the potatoes and beets. Hard to do with a knife. Please though… use the safety guard with the slicer. I saw a dude slice off 1/64th of his finger one time and it didn’t seem like a pleasant experience. Cheese is important in many dishes and I think this Beet Gratin benefits from both mozzarella and gruyere or swiss cheese. That said, you can easily over-do it here. You just need a small sprinkling of cheese in between layers. This is actually pretty straightforward. No reason to make it more difficult than it is. Lightly butter or oil your baking dish (I used a 2.5 qt. dish, but an 8×8 would work also). Add a layer of potato slices and a tiny bit of cheese. For once, don’t over-do the cheese. Then a layer of beets and more cheese. Repeat that process four more times until you have six layers. Then kind of press on the gratin so it compresses the layers a bit. Just pour it over the gratin and try to make sure it’s evenly distributed. Cover the Beet Gratin with foil and bake it for 45 minutes at 375 degrees F. Then uncover it and bake it for another 15-20 minutes. It should be fork-tender in the middle and lightly browned on the top and around the edges. 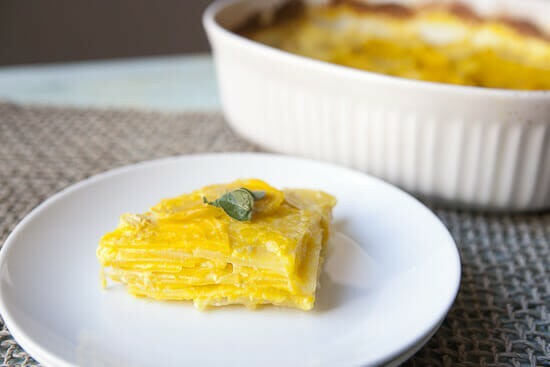 Let the gratin cool a bit and then slice it up and serve it. The layers and colors are really beautiful and it’s seriously delicious. 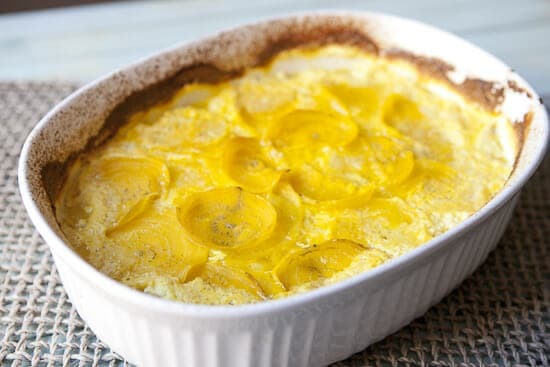 This was a fantastic gratin and I think a good twist on the all-potato variety. You could definitely use red beets for this, but I think it would end up in kind of a strange pink color. Golden is the way to go if you can find them. Do you have a mandoline slicer? Is a dish like this Beet Gratin worth the work? I’m not a beet fan no matter what color they are, but this looks so good it may make me change my mind. As for the the pronunciation of the slicing instrument, both my French courses and watching Julia all those years taught me it’s pronounced man-do-leen’ with the accent on the last syllable. Trying this tonight… Without a mandoline. #unitasker! Thanks for the inspiration. what is half and half? thanks! It’s just a pre-mixed version of 1/2 milk and 1/2 cream. Common here in the states. « Plastic-Free Grocery Shopping Part Two Recipes Home » The Internet Kitchen: Fry Party Returns!